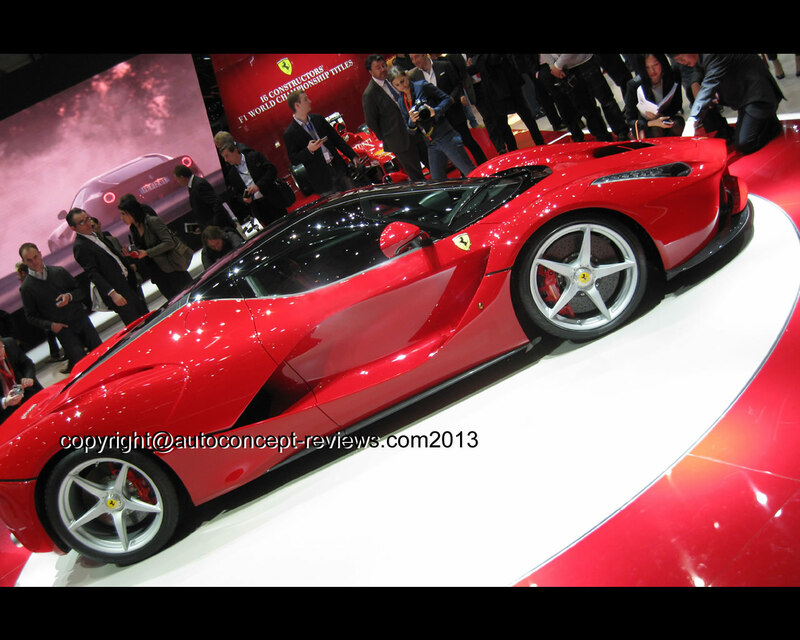 The new Ferrari supercar succeeding to the Enzo finally was launched at the 2013 Geneva Motor Show. It is the most sophisticated Ferrari homologated for the road with a combination of mid engine V12 and Hy Kers system electric motor. The design of the body was extensively developed in wind tunnel. 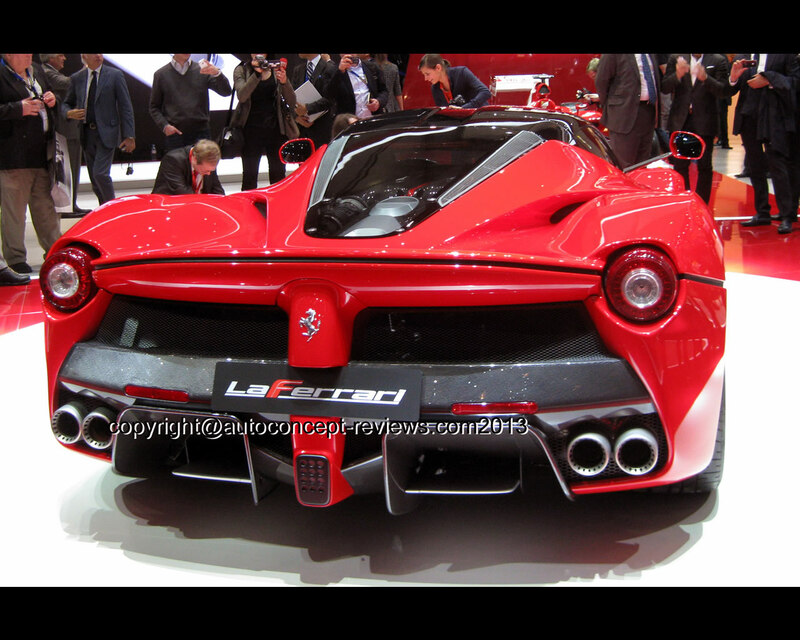 It is called LaFerrari. 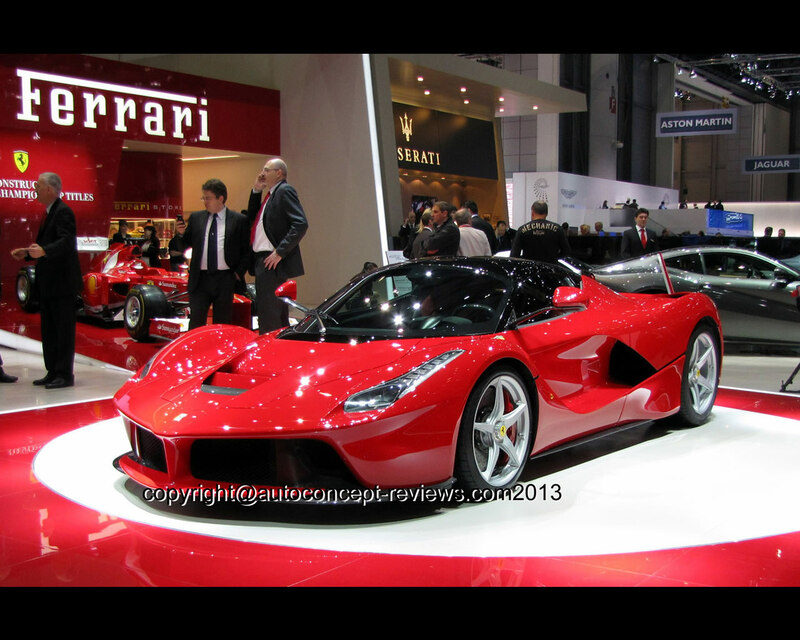 Only 499 LaFerrari will be produced. Here is the official introductory explanation: We chose to call this model LaFerrari because it is the maximum expression of what defines our company – excellence. Excellence is in terms of technological innovation, performance, visionary design and the sheer thrill of driving. Aimed at our collectors, this is a truly extraordinary car which encompasses advanced solutions that, in the future, will find their way onto the rest of the range, and it represents the benchmark for the entire automotive industry. LaFerrari is the finest expression of our company’s unique, unparalleled engineering and design know-how, including that acquired in Formula 1. 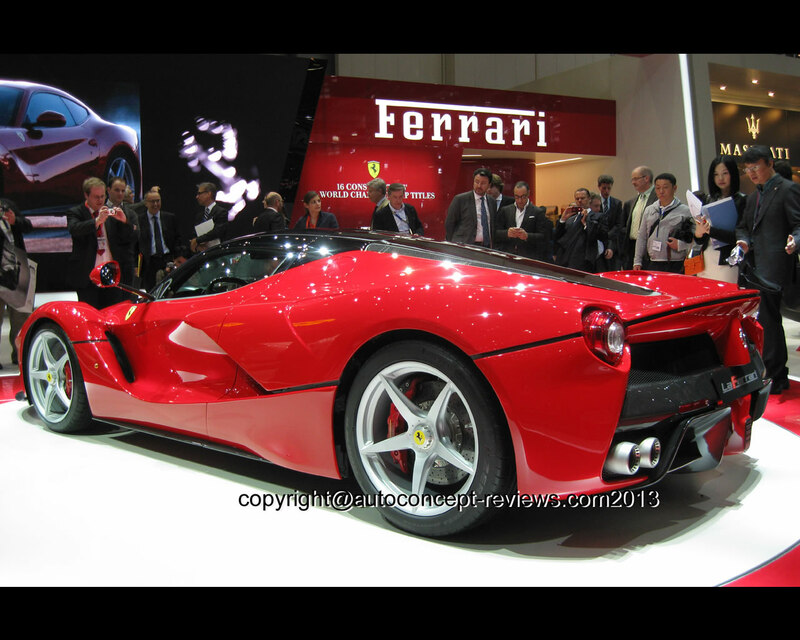 The LaFerrari is constructed around a carbon fibre structure already unveiled at 2012 Paris Mondial. (see photos N°27/28 and 28/28 above). The power-train includes Hy-Kers system inspired by Formula One technology recovering braking energy for an additional propulsion power. The electric energy is stored in complex high power battery weighting 60 kg. The electric motor has a maximum power of 120 kW (163 hp) and maximum torque of 270 Nm (28 kgm). The 65° V12 engine has a capacity of 6.262 cc (328.1 cu.in.) and has a maximum power of 588 kW (800 hp) at 9.000 rpm while the maximum torque is announced for 700 Nm (71 kgm) at 6.500 rpm. The maximum speed is claimed at over 350 kph (217 mph) while 0 to 100 kph (62 mph) is announced to require below 3 seconds. 0 to 300 kph (186 mph) is claimed to be completed in 15 seconds. 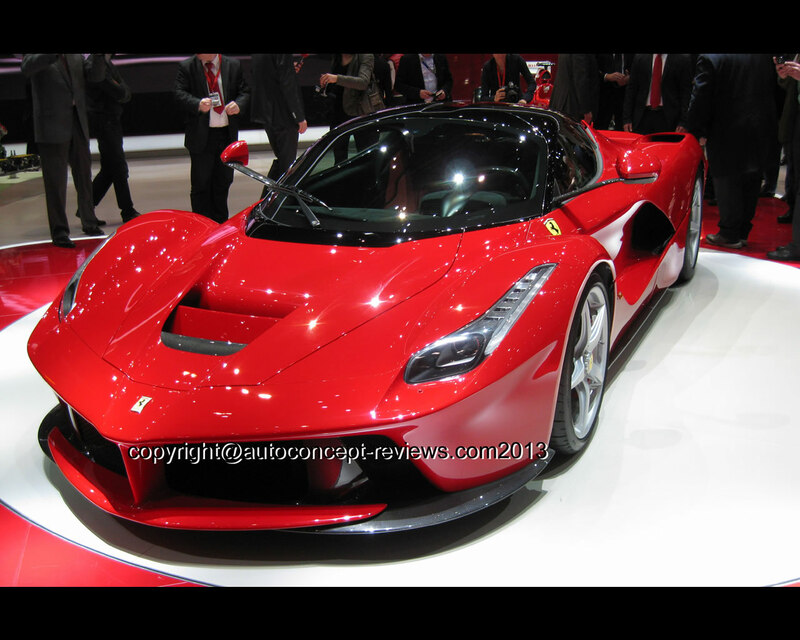 The LaFerrari is the first ever car with hybrid technology to come out of Maranello. The 6262cc V12 produces 800 CV and the electric motor a further 12o kW (163 CV) for a total of over 960 CV. Thanks to the huge technological leap forward represented by the HY-KERS system, the LaFerrari is the most high performance and efficient Ferrari ever built. Making full use of Ferrari’s F1 expertise with KERS systems which has been further developed for application to road cars, the HY-KERS guarantees maximum integration between the V12 and the electric motor, seamlessly blending extreme performance with maximum efficiency. The high levels of torque available at low revs from the electric motor allowed the engineers to optimise the internal combustion engine’s performance at higher revs, thus providing unending power throughout the rev range and a maximum torque peak of over 900 Nm. The electric motor was designed employing High Specific Power Density technology which enabled the engineers to drastically reduce weight and volume in relation to available torque. The result is performance figures that are comparable to those of the F1 car with the same torque density and the same efficiency (94%) or, in other words, very limited power dissipation. Battery size was an essential factor in optimising the HY-KERS’ weight-power ratio with the aim being to maximise performance while reducing fuel consumption. The solution was an extremely complex system consisting of 120 cells assembled into eight 15-cell modules, with a power output that’s the equivalent of 40 traditional batteries but weighing just 60 kg. The high-voltage batteries are actually assembled in-house by the Scuderia racing department. The batteries are charged in two different ways: under braking – even hard braking when the ABS intervenes, such as when driving on a track – and every time the V12 produces more torque than required, such as in cornering. In the latter instance, rather than the being sent to the wheels, the excess torque is converted to energy and stored in the batteries. The HY-KERS system is governed by the Hybrid Power Unit which controls the power delivery from both the V12 and the electric motor via two inverters and two DC-DC converters. The variable-frequency control makes torque delivery rapid and precise. This technology has enabled Ferrari’s engineers to maximise performance and reduce fuel consumption. C02 emissions have been reduced to 330 g/km without resorting to electric-only drive which was not within the mission of this model. 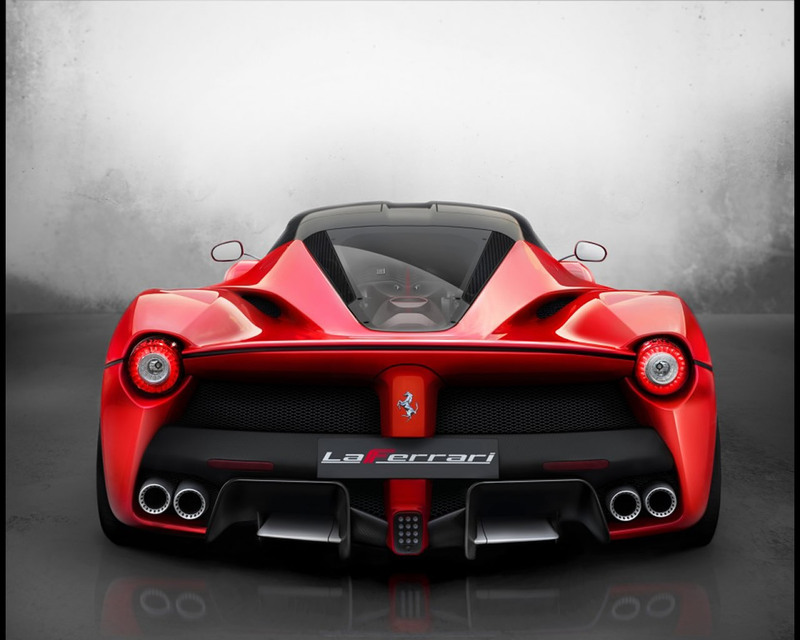 The HY-KERS system is, however, designed so that in future applications a car can be driven using exclusively electric power for a few kilometres and, during development testing, a full-electric version of LaFerrari achieved just 220 g/km of C02 emissions on the combined cycle. 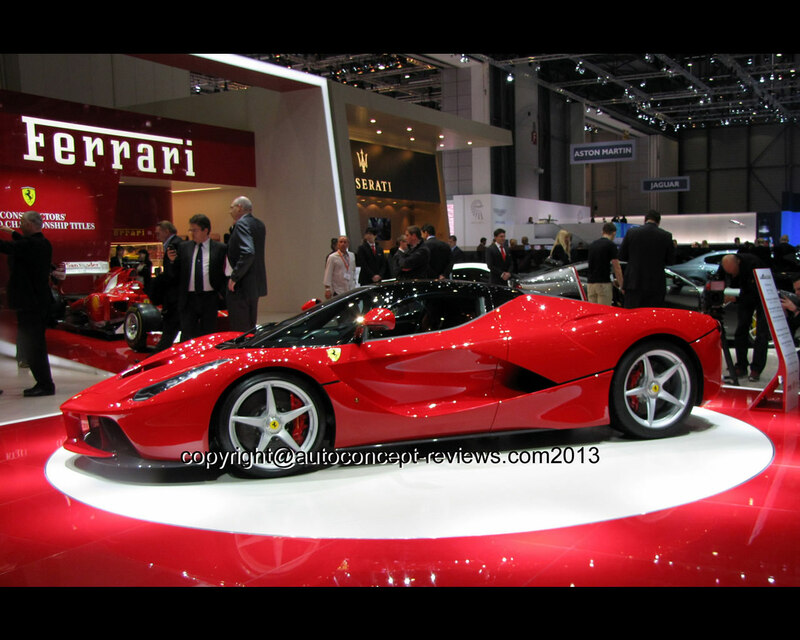 The 6262 cc V12 is the most powerful naturally-aspirated engine ever used on Ferrari a road car. As well as producing 800 CV, the V12 spins to 9250 rpm which guarantees fantastic performance and driving pleasure as well as that unmistakable Ferrari V12 sound. These completely unprecedented results can be attributed to work carried out in three areas: volumetric, mechanical and combustion efficiency. 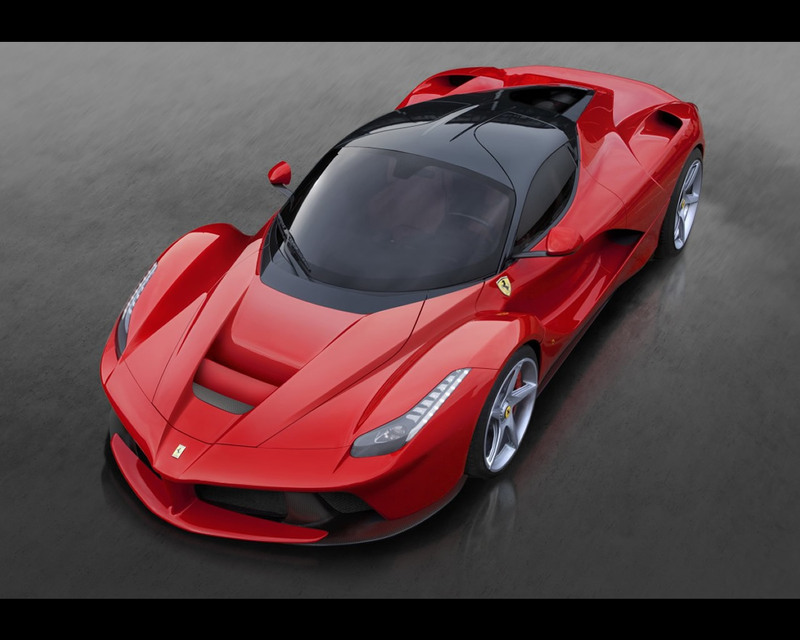 To increase volumetric efficiency, the LaFerrari employs continuously variable-length intakes – a mainstay in F1 engine technology until rule changes banned its use – which boost performance. As the length of the inlet tracts vary in line with engine speed, the torque and power curves are optimised across the rev range to suit the torque output of the electric motor. Total torque generated by the V12 together with the electric motor is over 900 Nm, with the instantaneous torque from the electric motor being employed at lower revs and with the V12 engine power and torque optimised at higher revs. The V12’s peak torque of 700 Nm is in fact developed at 6750 rpm. In addition the entire intake system – from the dynamic air intakes on the top of the rear wheelarches to the intake plenum – was designed to maximise intake volume efficiency. The engine also boasts a very high 13.5:1 compression ratio for maximum combustion chamber efficiency. To attain the performance goals set for the LaFerrari, Ferrari drew not only on the Scuderia’s F1 experience in the choice of materials, design and engineering, but brought in the expertise of Rory Byrne, the legendary F1 designer who was responsible for no fewer than 11 of Ferrari’s World Championship-winning cars. A working group of GT and F1 engineers designed a chassis which would provide maximum rigidity and minimum weight, despite the constraints imposed by incorporating the hybrid system. During the engineering phase a number of functions were integrated within the chassis design to reduce weight. One example is the seat structure which is part of the chassis, lowering weight and ensuring a more compact architecture and a lower centre of gravity. These uncompromising solutions guaranteed a significant improvement in performance characteristics over the chassis of the Enzo Ferrari, with torsional rigidity increased by 27 per cent and beam stiffness up by 22 per cent, while weight has dropped by 20 per cent. The chassis is built entirely in-house in Maranello alongside the F1 single-seaters using the Scuderia’s materials and production processes. Just like in F1, pre-preg composites of aeronautical derivation are employed: four different types of carbon-fibre are used, because each area of the body-in-black is engineered to guarantee the functional requirements it has to meet. Most of the tub is made of T800 – a first in the automotive sector – with both fabric and unidirectional tape being strategically hand laid up to ensure that the right material is in the right place. T1000 unidirectional tape and fabric is used in areas that are important for passenger compartment protection, such as the doors and the sills. Its high energy absorption characteristics pass the strictest side-impact legislation norms. Structural elements of the body are made using M46J unidirectional tape and fabric which is extremely rigid, but lightweight. For the underbody, carbon-fibre is combined with another specialist composite material, Kevlar®, which is used to protect the carbon structure from road debris damage. The multi-material approach was adopted for the entire body-in-black in order to reduce the number of components to the benefit of lower weight. An example is the one-piece rear section, which is a single piece hand laid-up using a combination of M46J and T800 carbon-fibres to obtain a very lightweight, yet rigid structure. The carbon-fibre is cured in the same autoclaves used for the F1 chassis in two phases between 130°and 150° C using vacuum bags to remove any voids in the laminate. 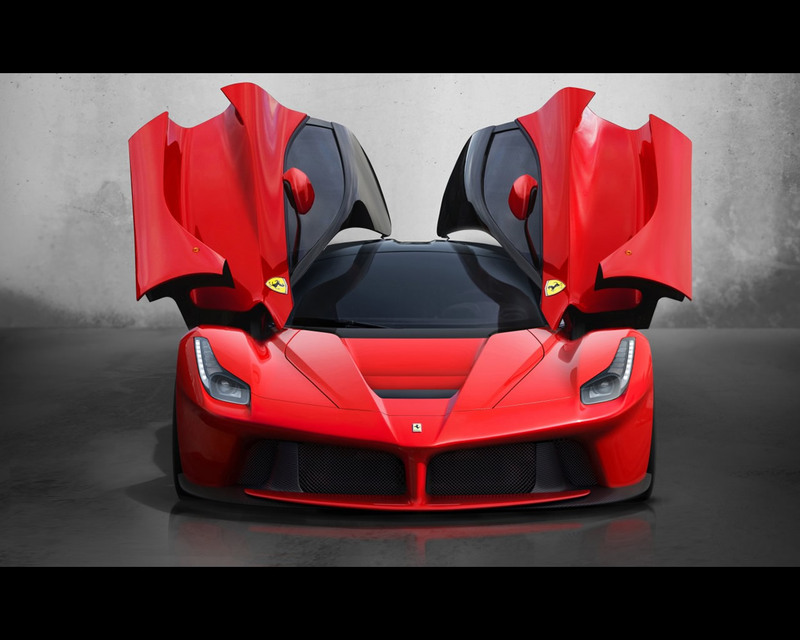 Aerodynamics play an essential role in the LaFerrari’s exceptional performance and are further example of the uncompromising carry-over of F1 technology to Ferrari’s production models. The engineers’ aim was to deliver the highest degree of aerodynamic efficiency ever achieved with any road car, with a coefficient of nearly 3, thanks to technical solutions honed with CFD analysis and fine-tuned in the F1 Wind Tunnel. Working closely with the aerodynamics department, Ferrari’s Styling Centre incorporated these advanced solutions into the car’s design and the result is the perfect balance of form and function, making the most efficient use of the air flows around and through the car’s body. What makes this design so innovative is its use of active aerodynamics conceived as a seamless integration of the car’s other dynamic control systems to deliver a genuine breakthrough in overall performance. The integration with the car’s controls and dynamic parameters ensures that the active aerodynamics adjust continually to hone both the downforce and its balance via the front and rear devices. In this way the LaFerrari combines the maximum downforce and minimum drag coefficient at every speed and in every driving condition. Thanks to its low height and reduced overall width, the LaFerrari has an extremely compact frontal section for low drag and the tapered, streamlined shape of the greenhouse optimises the air flow towards the rear cooling intakes. The scallop behind the front wheelarches boosts the extraction of air from around the wheels and improves the efficiency of the front diffuser as well as increasing downforce. The front wheelarches direct the airflow downwards which is then channelled by the flanks along the groove of the doors to the rear radiators. At the rear of the car, a pair of engine air intakes on the top of the rear wheelarches boost dynamic ram effect which increases power output by 5 CV. The shape of the one-piece rear section and spoiler are designed to maximise downforce. Meticulous development work was dedicated to perfecting airflow under the car with where a number of advanced solutions were adopted directly from F1. These include front vortex generators to boost downforce and efficiency. A central dam at the front of the car improves the efficiency of the spoiler and the forward section of the underbody. This area in front of the wheels incorporates diffusers which feature different expansion characteristics for the front and the outside of the tyre, with vertical fences which maximise the extraction capacity. • The guide vane on the front underbody, which at high speeds channels excess air away from the front radiator to reduce drag, closes to maximise efficiency. 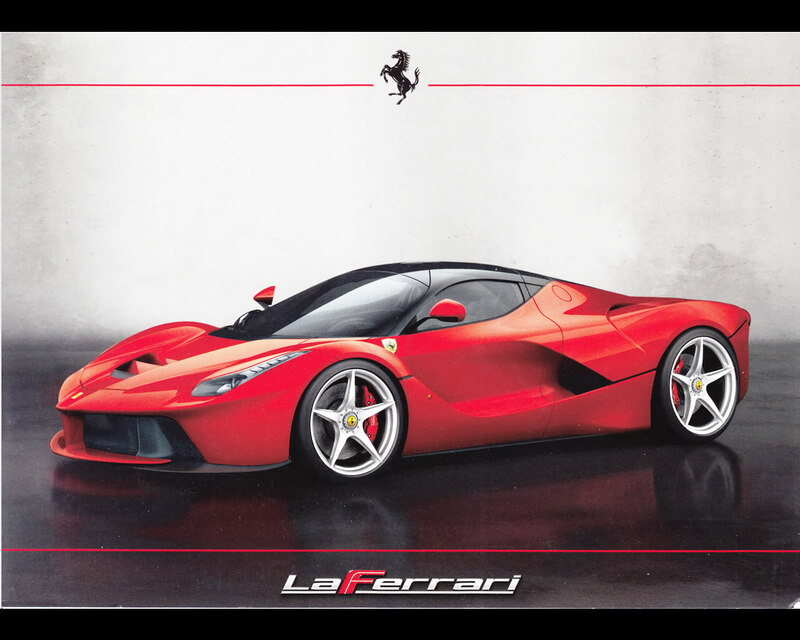 The LaFerrari’s overall silhouette and proportions are the very natural product of its architecture and the layout of its hybrid running gear. The design is striking and innovative, yet its sleek profile remains true to Ferrari’s classic mid-rear longitudinal V12 sports car archetype: the cabin and engine compartment volumes are contained within the wheelbase to achieve the best possible balance of its masses. Impressively, the addition of the HY-KERS system has not resulted in an increase in dimensions, but a better balance between the car’s front and rear overhangs. Seen from the side the car has a sharp, downward-sloping nose and a very low bonnet which emphasises its muscular wheelarches. The result is strongly reminiscent of the gloriously exuberant forms of late-1960s Ferrari sports prototypes, such as the 330 P4 and the 312P. The ratio of the front and wheelarch dimensions are also very much in line with Ferrari tradition. 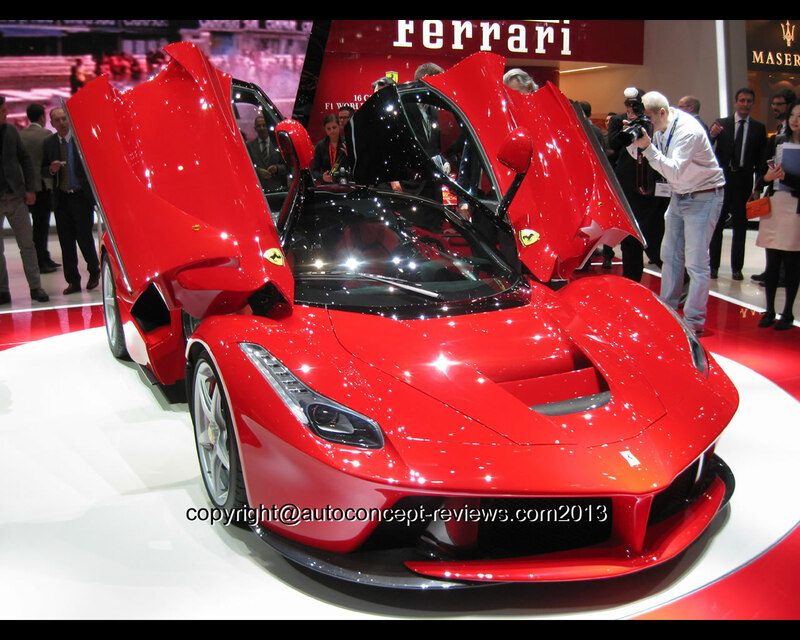 The LaFerrari’s body has been given a sculptural treatment heavily influenced by its aerodynamics. Its elegantly sculpted forms lend a sense of huge power and aggression to the wheelarches, with surfaces flowing fluidly rearwards over the cockpit and beautifully resolved forms that give shape to the volumes themselves. This fluid surface treatment provides both the exceptional drag and downforce characteristics required by the aerodynamicists, as well as very efficiently channelling air to the components requiring cooling. The car’s front section incorporates a lower front wing that appears suspended on a single central pylon beneath the nose, a clearly F1-inspired choice. Nowhere is the car’s extreme, sporty character more evident than in its tail section where its muscular power is uncompromisingly revealed. Here two deep grooves emerge from the interplay of surfaces over the imposing wheelarches. These efficiently channel hot air from the engine bay and in doing so contribute to boosting downforce at the rear of the car. The engine compartment ends in a full-width nolder beneath which is concealed an unprecedented active aerodynamic device. Sitting on a central pylon, which is stylistically reminiscent of the front one and which also serves to shield the HY-KERS system, is a large adjustable spoiler which deploys automatically and does not impinge upon the sleek design of the tail. The lower section of the tail features bare carbon-fibre and is dominated by deep apertures and a generous diffuser equipped with movable flaps that adjust when the motorised spoiler is deployed. The door panels are a genuinely integrated part of the cabin design as their sculpted carbon-fibre shells sleekly and efficiently hug its forms to afford occupants the greatest possible freedom of movement. 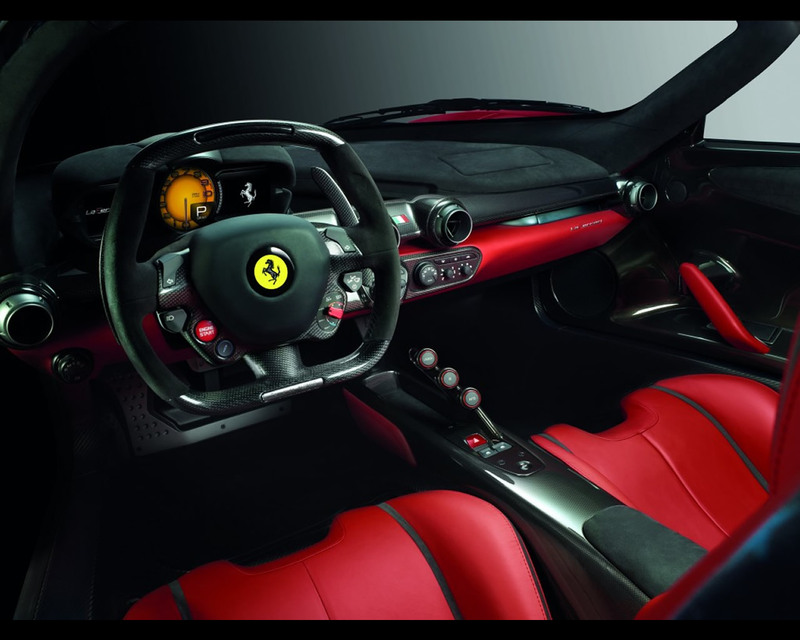 The LaFerrari’s steering wheel is another clear example of Ferrari’s on-going commitment to the kind of in-depth R&D embarked upon in the Enzo. The car’s various functions are integrated on the wheel Formula 1-style. The gear-shift paddles are now longer and more ergonomic. The signature bridge, on which the other F1 gearbox functions are clustered, has taken on a sleek, suspended wing-like shape on which the buttons are arranged for optimal efficiency. Lastly, the satellite pods from which the instrument panel functions and infotainment (audio, sat nav and telemetry) are controlled have been moved, respectively, to the door and an island at the centre of the dashboard with the latter also including a very compact climate control panel. For the first time on a Ferrari the dash features a reconfigurable, 12.3” digital instrument panel which gives the driver the choice of either a layout featuring the traditional central rev counter or a much more competition-style display designed for track use. 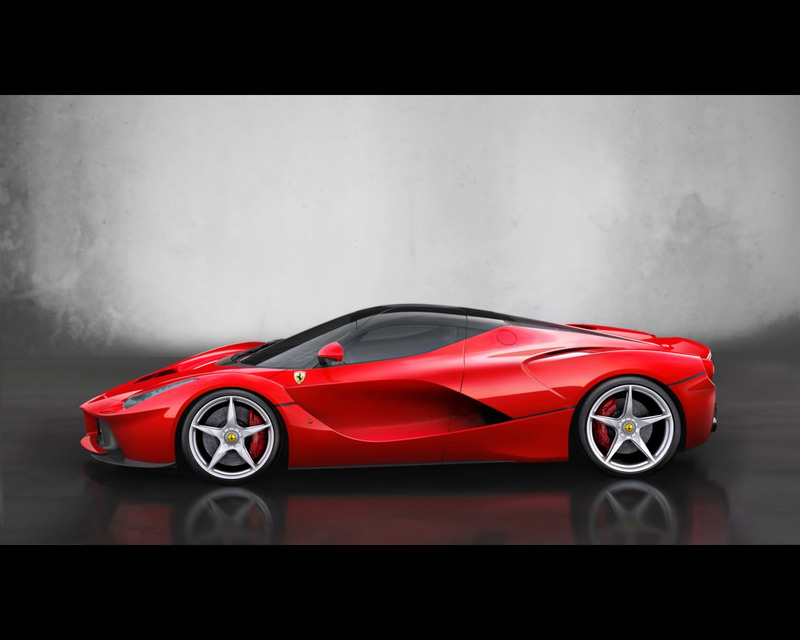 Thanks to myriad innovations across the board in its design and construction, the LaFerrari delivers absolutely exceptional performance, establishing itself as Ferrari’s fastest-ever road car. 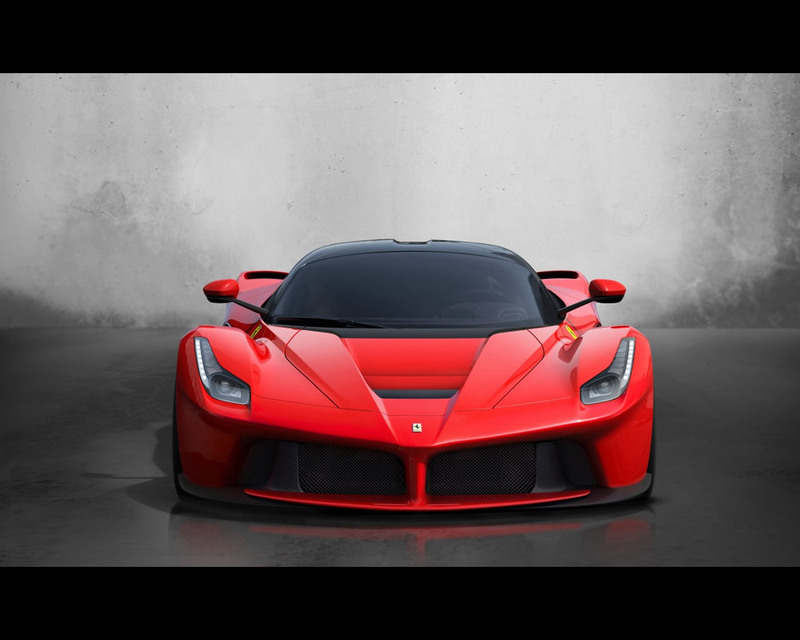 The LaFerrari slashes more than 5 seconds off the Enzo’s lap record at the Fiorano circuit. Such huge progress was made thanks to the hybrid technology and evolutions in traction and damping control, brakes and tyres. The integrated development of the entire car, particularly the tyres and suspension set-up, means that torque in the order of over 900 Nm can be fed through the wheels. Those levels of torque are produced by the combined effect of the V12 engine and the electric motor which provides instantaneous response at all times. The levels of performance meant that Ferrari has gone for a very specific tyres et-up, with 265/30 R 19 Prelli P-Zeros on the front and 345/20 R 20s on the rear. Thanks to the integration of the dynamic control systems, the active aerodynamics and mechanical set-up, the response time to steering wheel inputs when turning into a corner is 30 per cent faster and lateral acceleration in corners increases by 20 per cent.